Alarmingly, Turkey's proposed system lacks the safety mechanisms of checks and balances that exist in other countries such as the United States. The changes make Erdogan head of government, head of state and head of the ruling party -- all at the same time. He now has the power to appoint cabinet ministers without requiring a confidence vote from parliament, propose budgets and appoint more than half the members of the nation's highest judicial body. In addition, he has the power to dissolve parliament, impose states of emergency and issue decrees. Alarmingly, the proposed system lacks the safety mechanisms of checks and balances that exist in other countries such as the United States. It would transfer powers traditionally held by parliament to the presidency, thereby rendering the parliament merely a ceremonial, advisory body. 1. Erdogan's confrontational Islamist-nationalist rhetoric keeps appealing to masses who adore him for his claims of being in the process of restoring the country's historical Ottoman influence as a leader of the Islamic world. His rhetoric -- and practices -- would often echo an authoritarian rule in the form of a sultan. 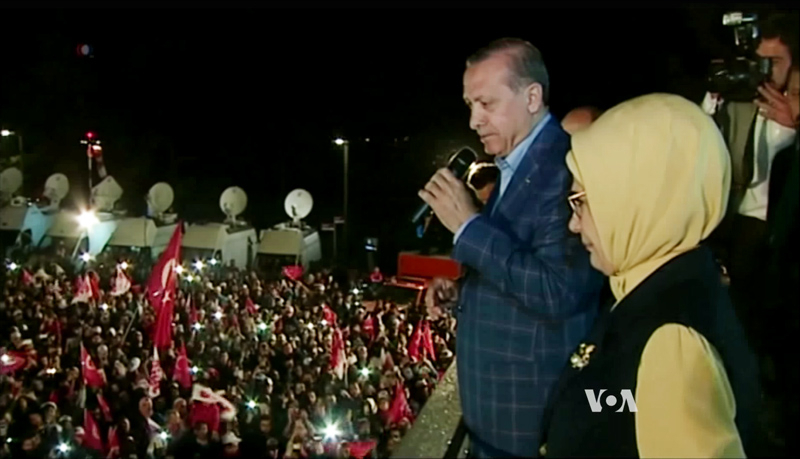 It was not a coincidence that the thousands of Erdogan fans who gathered to salute their leader after his referendum victory were passionately waving Turkish and Ottoman flags and chanting "Allah-u aqbar" ["Allah is the greatest", in Arabic]. For most of Erdogan's conservative fans, "God comes first... then comes Erdogan". That sentiment explains why the vote on April 16 was not just a boring constitutional matter for many Turks: It was about endorsing an ambitious man who promises to revive a glorious past. 3. A European Union (EU) parliamentary organization warned before the referendum that the democratic legitimacy of the vote was in question. It mentioned that the lawmakers' ability to campaign for the 'No' vote had been undermined by the government. "The conditions for a free and fair plebiscite on proposed constitutional reforms simply do not hold," said a report released by the EU Turkey Civic Commission. It highlighted, among several other reasons, that the co-leaders of a pro-Kurdish political party who campaigned for 'No' have been imprisoned since November on charges of links with terror groups. In the 15 months leading up to the referendum, says a civil rights NGO, police used violence to stop a total of 264 peaceful demonstrations in support of the 'No' campaign. Turkey's soul-searching and societal wars never have a moment of truce. Turkey's wars are not just between political leaders and parties; they are wars between the supporters of a democratic, secular country and those of a caliphate which Ataturk, founder of modern Turkey, abolished almost a century ago. As Kati Piri, the European Parliament's Turkey rapporteur, said of the referendum: "This is a sad day for all democrats in Turkey". PS to my earlier comment: From the Islamic viewpoint, Islam now has potentially within its grasp, control of the Bosporus and Dardanelles, the Straits of Hormuz, the Suez Canal, and if Spain regains Gibraltar the western entrance to the Mediterranean, most of the African coast of the Mediterranean, the Gulf of Aden, the Arabian Sea and much of the Indian Ocean, the Straits of Malacca, the Java Sea and Timor and Arafura Seas. Looks good for the Caliphate. But who would lead it - Turkey, Iran or Saudi Arabia? Will Britain restore its maritime capabilities? Trump is right about NATO. It is obsolete. Not just because of the new prominence of asymmetric warfare and non-state actors but also because the great divide in the world is now between Islam and the rest. Well, it's actually WW1 all over again but in reverse. How ironic that the British and their proxy army the US have tried so desperately to hold on to the geopolitical alignment they won after WW1 only to be right back in the same mess now. What a centenary! It's ironic. Kemal Attaturk managed to create a supposedly secular democratic state by first making Turkey an Islamic Republic. To do so he got rid of non-Muslims and many non-Turkish ethic groups in Turkey and imported Turkish Muslims from the Balkans. This was the essential development of a coherent society without which democracy cannot be sustained. That this coherent Islamic society would at some stage adopt Sharia and full Islamic rule was a near certainty. Attaturk's gamble was that it would be someone else's problem, because in his time material prosperity and securing a position allied with the West was the immediate imperative. So here we go. NATO is not primarily a political organisation, but a defence alliance. But it is under threat from the EU which is being blackmailed by Erdogan. What will it do about Turkey's membership? I guess that might depend on Putin. What will Putin do about an Islamic, Sharia dominated Turkey? Probably more than the West will. No doubt he is already eyeing his path from Crimea through the Bosporus and Dardenelles to the Mediterranean. This is where the West has fundamentally erred. The typical British assessment of Russia has been since 1917 to isolate it. They still bang on in this manner espousing flawed British policy 100 years out of date. One of the reasons the West has made such a mess of it's post WWII relations with Russia is by making assumptions, perhaps projecting it's own ambitions upon Russia. However Russia has a long memory of it's history with Turkey. The USA has no history and no memory and perhaps this is why their naivete is being taken for a ride by the British who themselves should know better. Yet Britain is the high seat of the Globalist vision so it has made moves in that regard and brought Turkey into the fold so to speak to try and prevent what is now unfolding, the rebirth of the Ottoman Empire. Russia will indeed do more about Turkey than the West, which has check-mated itself through pursuit of the Globalist 1984/Brave New World Order. Luckily Britain has a modicum of democracy and their citizens had enough sense to see the train wreck coming and vote Brexit. Hopefully France will do the same. That Germany and the EU and their lackeys in the USA will try to beat up on Russia is likely, unless Trump realizes he had it right when he declared that NATO was obsolete. You seem to be forgetting the communist interlude in Russian history. I know some Russians intimately from that period and since. After 1989 an effort was made to reach out to Russia but it ran into several problems. One was EU expansion. Second was the continuation of proxy wars and influences by USA and the new Russian sphere. Third was NATO expansion a very misguided idea but certainly not British led. It was definitely American led and enormously influenced by the EU which was beginning to flex its political muscle and greedily casting its eye over former communist and WP states for integration into the EU - power being based on territory and population, as far as the EU is concerned. This EU imperialism increased markedly after the Lisbon Treaty. Juncker's original five year plan was perfectly clear and honest: EU armed forces are needed for power projection in support of EU expansion. Ukraine was one of the EU's classic text book lessons on how not to do foreign policy. Merkel held a gun to the head of the democratically elected government and told him it's the EU or Russia, you cannot be neutral, you cannot be a buffer, choose. Putin responded as anyone who stopped to think would expect him to respond: he annexed Crimea. As regards British foreign policy, Blair set the trend downwards, to be followed by Brown and Cameron - even worse willy waving at Putin with nothing in his trousers, a total prat. Despite the grievous errors of recent foreign and defence policies I would not agree that stuck at 1917 is anywhere near accurate. If it were true at least it would be a policy. It is far worse. There is simply no understanding of international politics in the real world and an unbelievable naivety. It is utterly amateur, half baked and foolish. Thanks for the details Peter. I'm obviously not up to date on the modern intricacies of British policy and yes I understand now that quite rightly the US and EU have had a hand in developments. So, it's worse than I imagined. Great! Should Farage run in the 'snap' election? Is this May woman entirely out of her depth? Does anybody in England have a clue? Nigel Farage has to be in Brussels so there is someone we can trust to tell us what is going on. Yes I believe Mrs May is out of her depth. She is not bad, just not up to the task and a bit lefty. But the political class is not what it used to be, they've been levelled to a benchmark of mediocrity as a result of the real government being in Brussels for the last twenty or thirty years. Does anybody in England have a clue? Probably only my family and me, But I now live in Australia. I write and campaign but that's all I can do. Were I Burak Bekdil, I would hasten to find a safe haven in another country. The Turks have made the decision to turn back the pages of history, from the great march to modernity facilitated by Attaturk, to a new Hitler in the making. One cannot save a people from themselves. Longing for authoritarianism in the mold of an ideology that, from its inception, has brought about the deaths of millions of innocents, and that proves daily its deadliness everywhere one finds it, will prove to be disastrous for Turks. In Amsterdam, London, and other European cities where the instruments of democracy have been utilized to elect Muslim mayors, can we expect the same result? The triumphalist cries of Allah Akbar were heard ringing in the streets of Turkey when the results of the election were announced. Copious Islamic flag waving was also observed. Much of the conduct of Muslim ideologues in the West has left NO doubt in the minds of even the obtuse as to what is their preference. Adding the sheer numbers, and kind (75% young men of military age) of Muslim immigrants to Western countries, and the outrageous stupidity of European elected politicians, it is perfectly reasonable to forecast the success of Islam across the globe. Our politicians, whether out of sheer corruption, cowardice, lack of common sense and or intelligence, have paved the way for the eventual destruction of democracy, and all the great steps to modernity, provided by greater men and women than they. Do we have time to prevent this erosion of democracy across the world? We do. But first, we must rid ourselves of apologists for this ruinous ideology. It is neither peaceful, tolerant, nor in any sense of the word, democratic. It seeks the overthrow of democracy for all the same reasons 51% of the Turkish citizens did so, to ressurect a foreign, primitive governance, from a bygone and violent era. Perfectly summarised. Democracy is not yet dead but it is coughing up blood. Erdogan has already made himself dictator. He's just now making the law agree with the fact, so that he can claim his actions to be legal. Whether or not the results of the election are accurate makes little difference. If it was necessary to tamper with the election results to win, he did. I believe the vote might well have been tampered with as the margin rings too small for what is a very large country. Such a shame as it is beautiful, by all accounts - any chance the people voted that way because they didn't understand the full import of the meaning of democracy? The majority of people in most places don't understand freedom, or the responsibility that comes with it. Many don't want freedom, but a government to take care of them and a leader to follow. Erdogan mainly campaigned on restoring the supremacy of Islam and the power and prestige of Turkey's former empire, which most of the country probably does support -- though not necessarily by giving him absolute power. He may have actually won, but if he didn't, he wouldn't let that stop him. I want to thank the author for his courageous writing over the years. He dared to face these criminals and has now paid the price for just speaking his mind. For my part, the best way to deal with the likes of Erdogun is insult his honor- the Armenian genocide is and will always be a stain on Turkish history. To the extent he denies it and celebrates it; I am very hopeful that it will become an important item in US public debate. As you may know, the Turkish Cypriots voted NO, to everybody's surprise! The Turkish people voted for this madness. "Our friend and ally" of Barack Hussein and Hillary is officially now a normal Islamic state with a strongman supported by the mosque. At least now there are no ambiguities anymore. Erdogan's relationship with Obama was badly strained by the end of the latter's presidency. A real friend would be President Trump, who called to congratulate Erdogan shortly after the referendum. The outside world may not like the outcome but for the Turkish this was their choice. They will have to deal with the consequences.